LOCATION: Taro de Tahíche, s/n, Tahíche, Lanzarote. HOURS: From November 1 to June 30, 10 a.m. to 6 p.m., Monday to Saturday, including holidays, and in summer, from July 1 to October 31, every day 10 a.m. to 7 p.m. 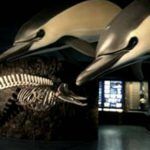 The price for the visit is free for Lanzarote residents and € 8 for visitors. PRICES: Free for Lanzarote residents (duly accredited). € 8 for visitors. INFORMATION: +34 928 843 138 and www.fcmanrique.org. 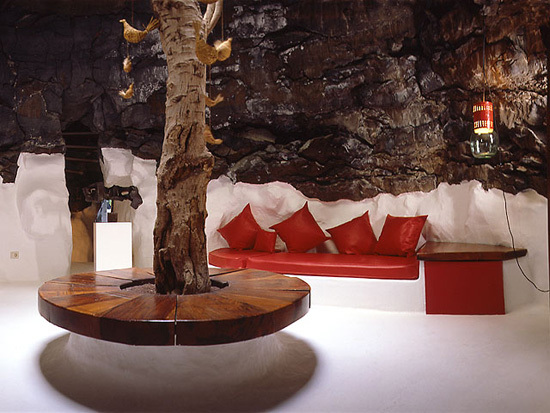 The organization in charge of protecting the works of the Lanzarote artist César Manrique houses the two main facets of the artist’s creation: his paintings and his public art works in the permanent museum of Taro de Tahíche, headquarters of the Fundación César Manrique (FCM), which was the residence of the creator. The first stop in the museum has on display the contemporary art collection of the FCM. 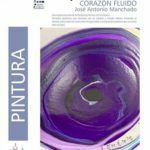 It is possible to observe the pictorial works of Pedro González, Chirino or Gerardo Delgado and the engravings of friends of Manrique and luminaries of Spanish art like Picasso, Tàpies, Joan Miró o Chillida. After seeing the samples of contemporary art owned by the Foundation we go on to the rooms of buildings and sketches, where some of Manrique’s older works involved in public spaces are on display. The blueprints of the Mirador del Río [Del Río Overlook] (Lanzarote), the Parque Marítimo del Mediterráneo [Maritime Park of the Mediterranean] (Ceuta) or the Seville Cultural Center can be admired in this room, along with the sketches for Manrique’s classic wind toys or the logo of the Timanfaya National Park (Lanzarote). 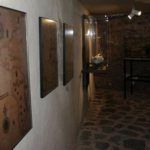 The art museum is momentarily interrupted with the descent to the lower floor, to the natural volcanic bubbles, of what was Manrique’s residence. 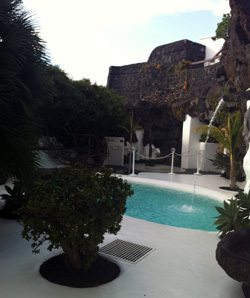 The visitor will be able to enjoy a living example of what is considered nature-art with the rooms created by the Lanzarote artist by taking advantage of the natural structure of the lava and its continuation in the jameo-pool [collapsed lava tunnel made into a swimming pool] in one of the gardens of the building. Manrique’s most outstanding pictorial works (Manrique Collection) constitutes the last stop at the permanent museum of the FCM. The strong colors he used, giving nature shapes to his oil paintings, is the most attractive aspect of his work. 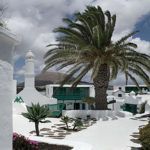 Having concluded the visit, you can walk around the ample gardens of Taro de Tahíche, where you will be able to see the large mural that the Lanzarote artist built with volcanic stone and tiles in a drawing for the opening of the César Manrique Foundation in 1992. 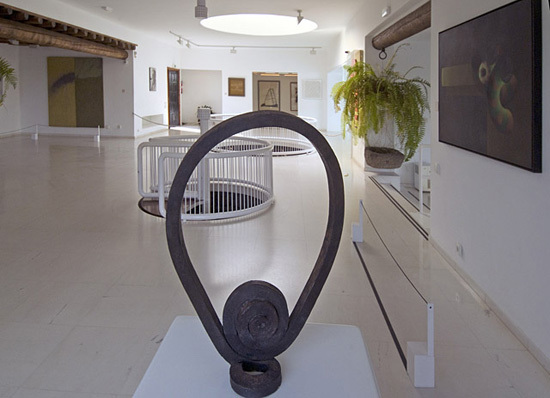 The Manrique organization has an extensive list of cultural and formative activities in different fields every year, which has made it one of the most important cultural organizations in Spain. 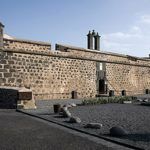 Besides, it exercises on the island and in the Canaries an ecological defense role in the field of awareness and participation in the most important public debates in Lanzarote. We will keep you updated about these in ocio daily in ociolanzarote.com. What to do before and after: We can approach Jardín de Cactus [Cactus Garden] (Guatiza), a public work of Manrique’s, take a stroll through the historical village of Teguise, a few miles from the Foundation, where there are also various restaurants, cafés and terraces. For a cup of coffee or tea or a drink we recommend Cafetería Cejas or Hespérides. For lunch or dinner, Ikarus.